In order to convince yourself as to the advantages offered by the HEINKEL systems, numerous pilot systems for product trials at your site are available through our comprehensive stock of rental units. 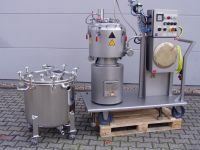 These allow you to perform basic tests putting you in a position to select the best machine for your solid/liquid separation, drying and mixing projects. 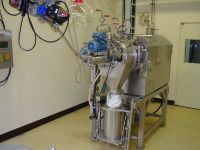 The evaluation of the test results in connection with special process engineering software permits a “scale-up” for future production systems. We support you on-site in running the tests and the optimisation work through qualified process engineers. These rental machines are so designed that they can be installed quickly and easily without incurring high costs. Of course all rental machines comply with the pertinent regulations and guidelines. Should you be interested in a rental machine, please contact us.